Coxreels produces the highest quality high pressure hose reels for a variety of applications, including industrial and residential solutions, to accommodate longer lengths of hose with increased stability and less vibration to any operation. High pressure hoses ensure that air or water flow is not interrupted so that hoses operate to their full potential. Coxreels is an eight decade, family owned industry leader in manufacturing hose reels that protect against bends, kinks and punctures to ensure the safety and longer life to the hose. This ingenious design also saves you money and time by becoming organized in your work fields. Hosexpress has Coxreels Hose Reels for sale with many options. 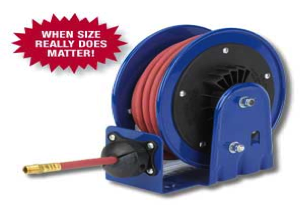 Reels can be purchased with the option to include the hose or not. Professional grade heavy duty steel construction on these reels ensure an ideal solution to managing bulky twin line welding hose.